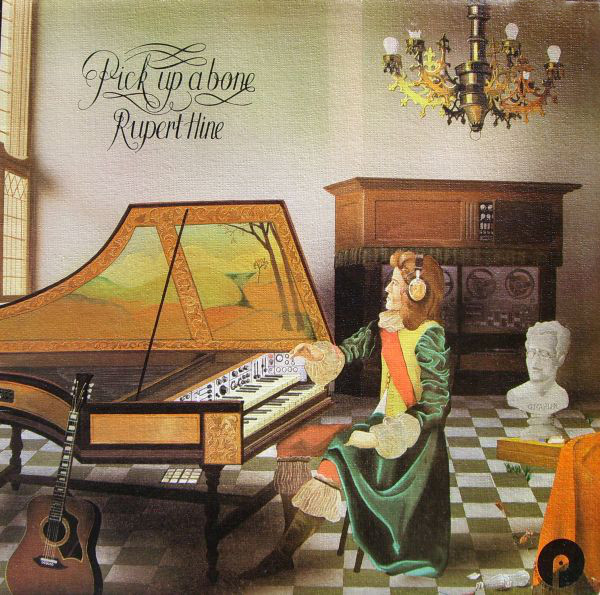 Join me as we take a look at two unique albums – Rupert Hine‘s Pick Up a Bone and the self titled release from Ohio Knox – that, although quite different musically, wear their idiosyncrasies on their sleeves and share a similar spirit: a mix of the sardonic, the sensitive and the sincere. Both take great pleasure in playing with words and both were issued in the bygone year of 1971, when hippiedom was fading and new directions in singer-songwriter, country rock, jazz rock, and prog were shaping up on the “Me Decade’s” horizon. You’ll hear a bit of all that scattered in these songs, but both albums are too intelligent and laced with humor to fall into any of the less appealing traps those genres eventually morphed to. Let’s get down to the who’s and what’s, shall we? Who? : For somebody whose name isn’t likely to ring the bell of the average music listener (if such an entity exists), Hine has had one of the more fascinating careers in music. Starting in the 60s as half of a duo with David McIver, they put out a cover single of Simon & Garfunkel’s “Sound of Silence”… which resoundingly flopped. Undeterred, Hine went on to release a variety of diverse solo albums in the ensuing decades, influential to other musicians and loved by critics (don’t be put off – regular people liked ‘em too!) But then he got into production and that’s when he really made his mark – helming works by The Fixx, Howard Jones, parts of Tina Turner’s multi-platinum Private Dancer, Duncan Sheik’s hit debut, Suzanne Vega, Rush, working with Kate Bush and many more. He even found himself in a two-year romantic relationship with Stevie Nicks after producing her Other Side of the Mirror album. If that all piques your interest, I recommend an extensive podcast interview he gave to The Hustle. Lyricist McIver went on to become an entertainment lawyer. There’s more money in that than passion birding. Cover Art: A striking painting done in the Renaissance style of our Mr. Hine garbed in 17thcentury finery at the piano…with a pair of headphones on (and the piano has some decidedly not of-the-era electronics). 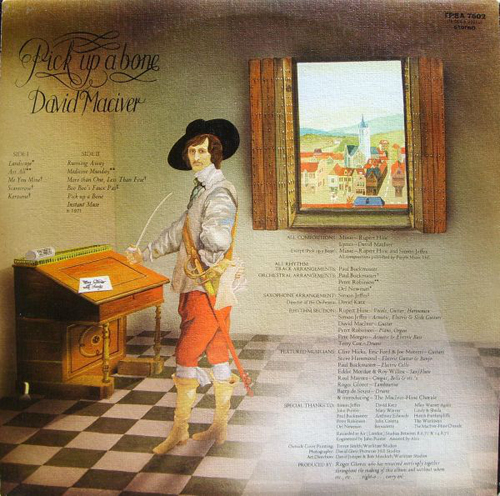 Painted by a “Trevor Smith of Wurlitzer Studios”, similar to Peter Cross’ art on original Genesis guitarist Anthony Phillips early solo albums – and hey, Hine produced a pair of Phillips albums, proving that everything is connected. Rupert Hine’s next album had a close up of a big ol’ eye. Hine sees all. Who? 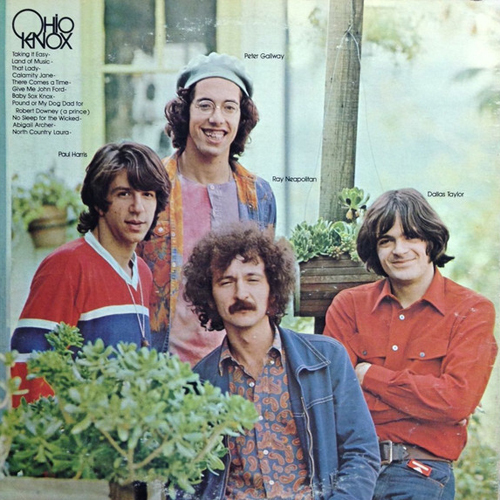 : Ohio Knox was really Peter Gallway who wrote and sang all the songs, though it’s also kinda the name of the band – there’s a bit of an identity crisis going on here. In the album, Gallway is pictured and identified as Ohio Knox. Keyboardist Paul Harris is captioned Ox Knox. There’s also an Oscar Knox and The Knox Brothers. Band member Dallas Taylor (who went on to drum for Crosby, Stills and Nash and Manassas) is just captioned as “Dallas”, with no Knox sobriquet. Maybe he was a distant cousin. Perhaps the song “Baby Sox Knox” provides a clue: “Listen when the opportunity knox / listen when you’re looking for rocks / listen with a brother called ohio knox / listen to the spirit in the baby sox.” Does that help? Good, lets move on. 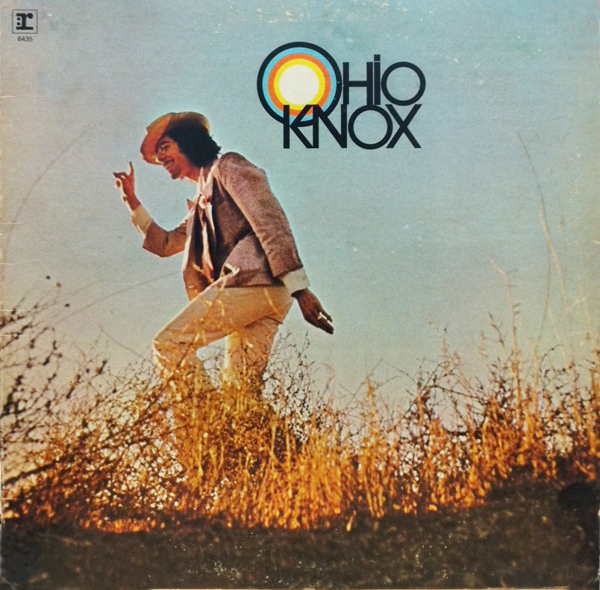 “Pound or My Dog Dad For Robert Downey (a Prince”) made it onto the 1971 Warner Bros. sampler Non Dairy Creamer – nestled among the appropriate company of Little Feat, John Martyn and Peter Green – and is a good representation of the songs on Ohio Knox. Catchy melody, offbeat lyrics demonstrating a fun-with-word sounds approach: “My dog dad was hot and why not / my dog dad wasn’t bad / but rabbit got him good understood / lost and found found found / in the pound”. Robert Downey is of course the actor/filmmaker father of his more famous son Robert Downey Jr. Not sure why he’s name checked in the song title, but there’s prob’ly an interesting story attached. “Down down down downey down / in the pound”. “No Sleep for the Wicked” actually arrives next with a groove that won’t quit, keeping the wicked as well as the nice awake. Cover art: Gallway is caught in mid-pose-dance-strut in a field as the sun rises (sets?) behind him. 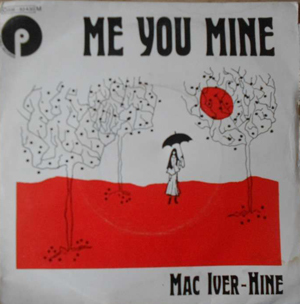 It’s cheesy, but it works as it’s got a certain appeal and reflects the humor lurking within, should the adventurous listener spin the platter (or click “Play” on their screen these days). Back cover band photo has Gallway looking very unfunky, young and geeky. But that’s okay. We know he’s got the goods and can deliver.